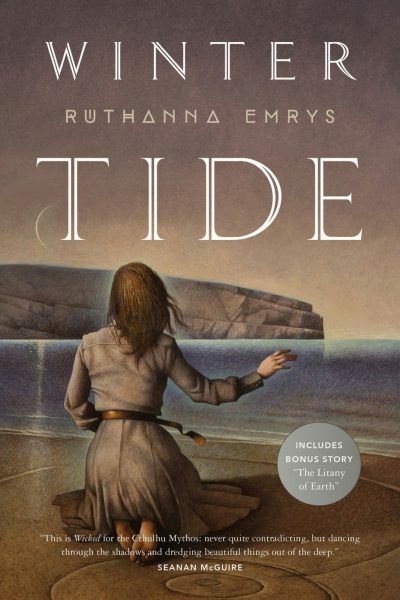 2017’s Winter Tide is the first volume in Ruthanna Emrys’s Innsmouth Legacy series. The American government’s ample experience at rounding up and exterminating unwanted indigenous populations was evident in 1928, in the campaign against the Deep Ones. The government swept up the entire population of Innsmouth, consigning the unlucky inhabitants to incarceration and eventual execution in a desert concentration camp. By the time Japanese internees began to arrive in the 1940s, just two Deep Ones were left: Aphra and Caleb March. Inadvertently freed with the Japanese internees at the end of the war, Aphra and Caleb prefer to avoid contact with the authorities who targeted their race for extermination. How unexpected, therefore, for the former génocidaires to reach out to Aphra for help. The peace that followed WWII saw former allies transform into bitter enemies. The Cold War divided the world between two alliances, one dominated by the United States (at that time an independent nation) and one dominated by the Russians. Although the two sides eschew open warfare for the moment, they are quite willing to engage in conflicts short of war. Such as espionage. Disturbing rumours have reached American ears, suggestions that the Russians are dabbling in mind transference. While humans are not experienced in such matters, the ancient and nigh-immortal Yith are dab hands at them. Some Yithian techniques have been recorded by humans who knew too much, and their texts collected by the savants at Miskatonic University (Go ‘Pods!). Could the Russians be raiding Miskatonic’s library? Helping the American government may be the best chance Aphra will get to recover her people’s lost legacy, some of which is preserved in the restricted stacks of the Miskatonic library. But the chance is, well, chancy. The US agents don’t like or trust the Deep Ones. The Russian agents may target Aphra. And the endlessly curious professors at Miskatonic may take their researches a tad too far. The Yith survive calamity by swapping minds with victims in less fraught eras. As a side effect, information about the distant past and far future is available to those with access to the right works (not that knowing the future will allow people to circumvent it). There are hints of Stapledon (1886–1950) in the long history at which Winter Tide hints, a history drawn from Lovecraft’s (1890–1937) works. Chance resemblance? Zeitgeist? Influence or imitation? I don’t know. Nor do I know how the notoriously racist Lovecraft would have reacted to the notion of Deep Ones (or for that matter, Japanese) being treated sympathetically. It might have caused a debilitating aneurysm or at least apoplexy. Cue schadenfreude. Which is to say, I reject his xenophobia and enjoy the subversion of his tropes. Although billed as a Cold War spy story, Winter Tide is less about espionage and more about human hubris and petty cruelty. It also deals with the aftermath of genocide. Sounds grim? Yes, but, oddly enough, I liked it. Even though it was enough of a demanding pleasure that I took longer than usual to read it. A survivor of state-sanctioned horror, Aphra is an engaging character and the novel is finely crafted. Recommended for the discerning reader who does not mind grim. Winter Tide is available here (Amazon) and here (Chapters-Indigo). "There are hints of Stapledon (1886–1950) in the long history at which Winter Tide hints, a history drawn from Lovecraft’s (1890–1937) works. Chance resemblance? Zeitgeist? Influence or imitation? I don’t know." Chance or Zeitgeist. HPL read LAST AND FIRST MEN after he completed THE SHADOW OUT OF TIME. "Nor do I know how the notoriously racist Lovecraft would have reacted to the notion of Deep Ones (or for that matter, Japanese) being treated sympathetically. " Judging from his letters, HPL would have been OK with sympathetic treatment of the Japanese. Unlike Blacks and Australian Aborigines, he regarded them as equal to Europeans. "The American government’s ample experience at rounding up and exterminating unwanted indigenous populations was evident in 1928, in the campaign against the Deep Ones." Are the Deep Ones depicted as indigenous in the book? In THE SHADOW OUT OF TIME, they are depicted as an immigrant population.